Aside from the now working Walkie Talkie app, a new "Now Playing" widget appears at the top of the active watch face whenever music is currently playing on a connected device. Tapping it takes you directly to the Now Playing screen. Similarly, a Walkie Talkie icon resides in the same place whenever it is enabled. Both the Now Playing and Walkie Talkie icons fit in the same place that the Workout icon does when in the middle of a session. Beyond those two major additions, not much has changed with this developer beta. Related to Apple Watch, the latest iOS 12 update references several as-yet-unannounced Apple Watch models, which could debut as early as this September. If you haven't already, check out AppleInsider's exhaustive list of changes coming to watchOS 5 when the OS launches this fall. 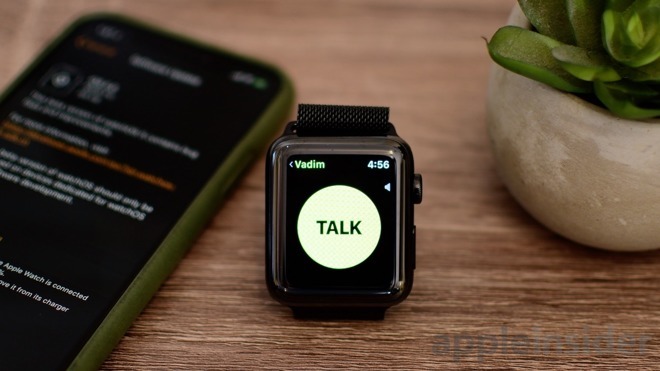 watchOS 5 brings the new Walkie Talkie app, improvements to the Siri watch face, grouped notifications, support for Siri Shortcuts and much more. The new watchOS 5 update will be made available this fall for all Apple Watch models (minus the original Series 0 model) alongside iOS 12, macOS Mojave, and tvOS 12.